Meningococcal Meningitis is a serious, potentially fatal bacterial infection that causes swelling of the lining of the brain and spinal cord. 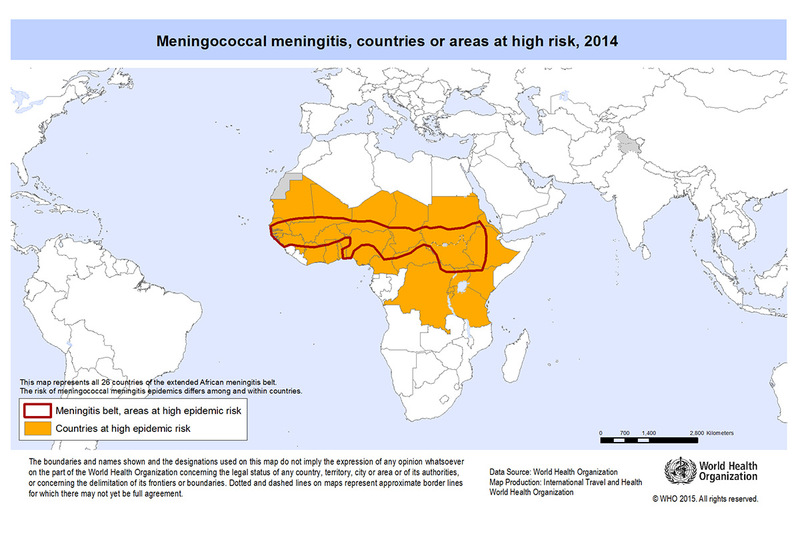 Countries at risk Although meningitis is a worldwide risk there are a few countries across Africa that have a much higher risk known as the ‘meningitis belt. Transmission of the meningococcal disease is via respiratory droplets and is a higher risk in overcrowded places. Wearing face mask and good hand hygiene may reduce the risk of infection. Meningococcal Meningitis often presents itself with a sudden onset of fever, headache, nausea & vomiting. These symptoms can occurs minutes to hours after infection. Neck stiffness is another symptom of meningitis. Travellers to high risk areas are advised to receive a meningitis vaccine. The meningitis vaccine is a requirement for travellers planning on going to Saudi Arabia for the pilgrimage to Hajj or Umrah and will not be allowed into the country without the appropriate certificate. The vaccination will last for up to 5 years. The meningitis vaccine is now also required for students at school and at university.